Ram Trucks put its power on full display at the New York Auto Show, and created extra buzz by showing off a bit of color. 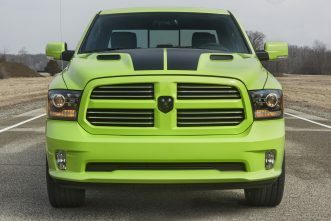 New colors showcased in the Big Apple included the Ram 1500 Sport Sublime Green and the Ram 1500 Rebel in Blue Streak. 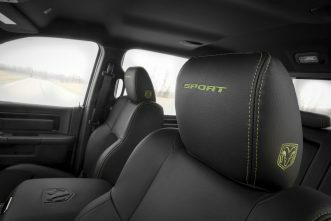 The limited-edition Ram 1500 Sport Sublime Green rumbled into New York with its 5.7L HEMI® V8 that delivers 395 horsepower and 410 lb-ft of torque, paired with the TorqueFlite® 8-speed automatic transmission. And talk about unique — with just over 2,000 in production, this Ram Sport stands apart from and ahead of the crowd. Features include a sport performance hood with black hood decal, deluxe cloth high-back sport bucket seating, Sublime Green body-color grille with bright billets, interior trim with Sublime Green accent stitching and black anodized spears and trim rings, and black Ram’s head tailgate badge and bodyside exterior badging. 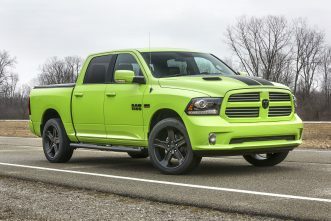 The Ram Sport Sublime Green is available in Crew Cab, 4×2 or available 4×4, with 20-inch black semi-gloss aluminum wheels standard on 4×4, 22-inch polished aluminum wheels standard on 4×2, and for the first time ever, 22-inch black semi-gloss wheels available on 4×2. 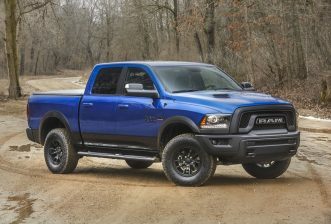 The rugged attitude of the Ram 1500 Rebel added a touch of New York swagger in the form of a new available color: Blue Streak. This new color will be available on 4×2 and 4×4 models, and in monotone or two-tone. In keeping with the bold, aggressive styling of the Ram 1500 Rebel, the new color comes with a black interior, and can be paired with the available Black Rebel Group.